Twitter never sleeps (not unlike many journalists). And as an aspiring journalist myself, I’ve found it fascinating to witness the trend of writers, reporters, editors, and photographers using the platform to inform the public. Journalists are harnessing their personal twitter accounts as professional mouthpieces to spread news in their communities. Take Santa Barbara’s own John Palminteri – it’s easy to understand why putting a face behind the news makes it more relatable and trustworthy. Identify Your Goal and Audience. Before posting content to your Twitter page, it’s important to identify what your overall objective is and who you want to read your tweets. For me, the goal of my Twitter page was to increase the views on my published articles and notify the local community of news happening around them. Image is Everything. When posting to Twitter you should ask yourself, what is going to catch the attention of someone scrolling through hundreds of tweets a day? Since we can only use up to 280 characters on Twitter, adding a picture or video to your tweet increases its appeal and can draw in more views, and eventually, more followers. Utilize Hashtags. Hashtags are a great way for other users to quickly find specific topics of conversation. 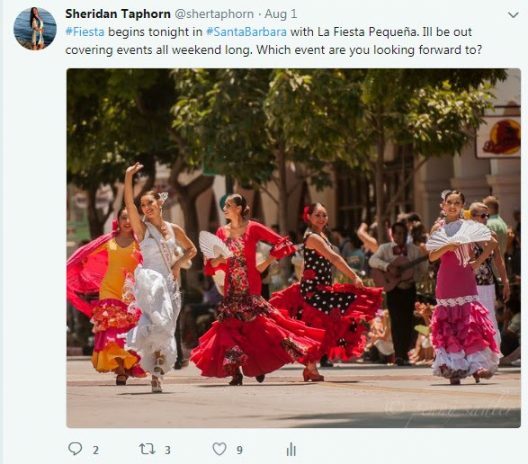 For example when I am tweeting about local news, I am always sure to use #SantaBarbara or #Goleta to identify where the story is happening. Make sure to only hashtag relevant words or topics in your tweets, because hash-tagging every word can be overwhelming. Engage, Engage, Engage. Follow accounts that you admire or share similar goals with. I mostly follow news accounts and established journalists that I look up to because they are great information resources and we all share a common goal: news. Retweeting and responding to other users are great ways to actively engage in conversations with your audience. Finally, post frequently to keep your audience up to date. After all, people are following you for a reason and if you disappear, they may seek out other resources for the information you should be providing. Though these tips are geared to journalism and Twitter, I see them being useful in whichever field of business you are in. Building up your brand can benefit not only yourself, but your business as well.